We all need to indulge our sweet tooth every now and then, but if you're going to enjoy some sugary treats, don't settle for second best. A dessert is something to be savored from the first bite to the last, and low quality sweet treats simply aren’t worth the calories. For the finest donuts in all of the Tampa Bay area, choose Dough. Twinned with the iconic Datz restaurant in the heart of the city, Dough lets you take a deep dive back into the sugar-coated enjoyment of your childhood. Decorated with bright colors and whimsical themes, this dessert shop almost looks like you stepped into a fairy tale wonderland or gingerbread house, complete with a friendly team of hard-working bakers who never stop raising the bar and dreaming up new ways to tantalize your tastebuds with donuts, cupcakes, cheesecakes, cookies, and more. No matter what kind of sugary treats you enjoy the most, you'll find them at Dough, with some of the most popular ingredients including Oreos, Fruity Pebbles, and a whole lot of chocolate, as well as more eclectic blends and crazy concoctions like the Maple Bacon Donut or the iconic Doughnut Cone. Dough easily stands out as one of the best dessert shops in all of Tampa. 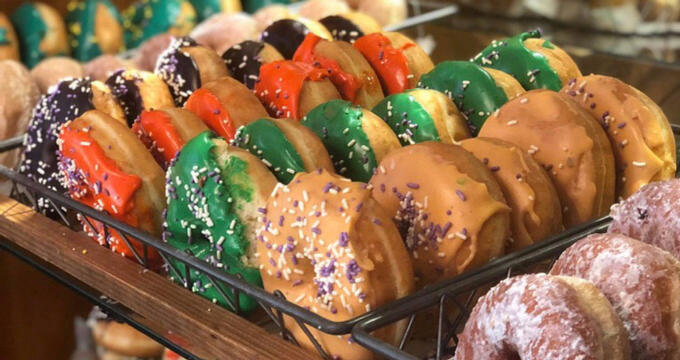 In fact, the entire Tampa Bay area simply can't compete with these sweet treats, and Dough has swiftly established itself as one of the top places to go when you're in need of a little sugar boost. The restaurant is closely connected with Datz but totally focused on sweetness and fun, having won multiple awards for the quality of its baked goods. Expert confectioners Tina Contes and Jen Greif Reese work together with their team of bakers to produce some outstanding culinary creations with customer satisfaction and smiles being the primary focus. Blending together all kinds of ingredients in fresh new ways, Dough is able to offer an exciting line-up of delicious desserts of all shapes and sizes. Whether you're looking for a chocolate-covered concoction or something juicy and fruity, you'll find it here. Dough is located at 2602 S MacDill Ave, Tampa, FL 33629. It opens every single day of the week, but hours can vary from day to day. For instance, Dough is open from 7am to 10pm on Monday through to Thursday, but stays open an extra hour on Fridays. It opens from 8am to 11pm on Saturdays and 8am to 9pm on Sundays, too, so those fresh, tasty donuts are always ready to be eaten on any day of the week. The menu at Dough features a huge range of offerings including artisan donuts in many different varieties; you'll find all the classics like Chocolate Sprinkle, Cinnamon Cake, Vanilla Glazed, Chocolate, Jelly-Filled, and Vanilla Sprinkle, as well as speciality flavors like Nutella, Cereal, Boston Cream Pie, French Toast, Apple Fritter, Chocolate Peanut Butter Cup, and Cherry Pie. You can also choose to add some ice cream to your donut, or just eat some ice cream on the side, with many different flavors available throughout the year and lots of toppings to choose from too. As well as the donuts of Dough, you'll also find an awesome range of brownies and cupcakes here including flavors like Red Velvet, Rainbow Funfetti, and Triple Chocolate, with various seasonal offerings also available at different times of the year to spice up the menu a little. You'll also be able to choose from a huge range of cakes and cheesecakes, with flavors like Strawberry Champagne, Birthday Party, Florida Key Lime, Candy Bar Explosion, and Root Beer Float, plus the option to add a shot of booze to any dessert for a small extra fee. If you're looking for something a little more savory, Dough also offers some sanwiches and breakfast pretzels with fillings like ham, cream cheese, white cheddar, and more. Dough offers a huge selection of great quality sweet treats and baked goods for any occasion, but if you want something really specific, this dessert shop also has the option of letting you order a fully customized cake, just the way you want it. This is ideal for parties or special occasions like someone's birthday or an anniversary. You'll have access to a huge array of options concerning the cake's size, flavor, fillings, icing style, and more. You can even choose accent colors to stylize the cake the way you want it, add in extra toppings like sprinkles, Oreo bits, or peanut butter cups, and choose to have a message written on the top in delicious icing. You only need to give 72 hours notice to get a custom cake made at Dough, so it's a great way to liven up your life at any time of year. Add a big splash of color and sweetness to your next special event or gathering with catering by Dough. As well as providing a super line-up of treats in its Tampa shop, Dough also offers full catering services as and when you need them. All you need to do to get started is share some info about your event with the Dough team, including the type of event you're organizing (wedding, business lunch, etc. ), the date, the expected number of guests, and some contact details. From there, a member of the Dough team will be in touch to organize the details of your catering package. This is a great way to turn a simple event into an amazing one, with Dough's excellent desserts sure to liven up any party or occasion and ensure that every attendee has the best possible time.